The Supreme Court, in a landmark ruling Thursday, upheld President Obama'shealth care overhaul, including the controversial requirement that most Americans have health insurance. Obamacare supporters celebrate as they respond to the Supreme Court ruling . 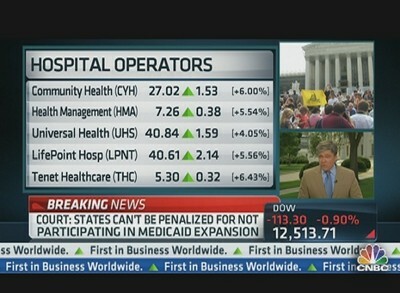 Stocks of hospital companies moved sharply higher on the decision, including HCA Holdings[HCA 29.47 2.86 (+10.75%) ], Community Health Systems [CYH 27.54 2.05 (+8.04%) ] and Tenet Healthcare [THC 5.25 0.27 (+5.42%) ]. 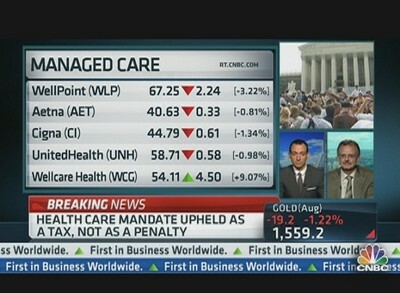 Medicaid-related stocks such as Amerigroup [AGP 65.47 3.07 (+4.92%) ]and Molina [MOH 23.16 1.84 (+8.63%) ] also jumped. The markets overall were sharply lower amid skepticism that European leaders would be able to form a solution to tackle the ongoing debt crisis. гead more, Please do keep up the fantastic work.